When building your company, brand identity is an important aspect that should not be overlooked. Brand identity is all the visual elements of a brand, as perceived by consumers. When choosing a brand for your company or small business, it may help to choose a retail brand that’s well known — as it can bring in attention from customers and in return, more sales. 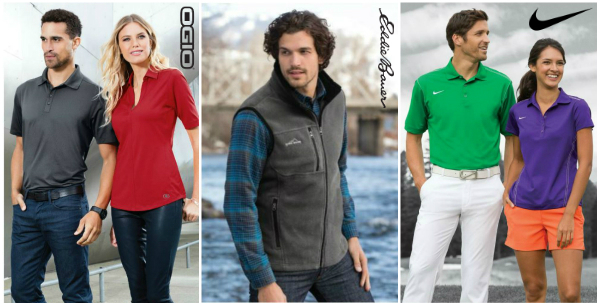 Instant Recognition – Popular name brands, such as OGIO or Columbia, are important because they offer instant recognition, as well as add a certain intrinsic value to the product — all because of the brand name. Adding your logo alongside the iconic Nike Swoosh symbol adds an element of trustworthiness to your brand, as customers all know and trust that Nike produces high-quality products. Puts Consumers At Ease – With recognition comes the feeling of ease for customers. Customers feel at ease when they recognize a brand that they’ve seen numerous time on the TV, walking down the street, or even at the airport. Customers are more willing to purchase a brand they are familiar with than one that they have never heard of. Tested and Proven – Popular retail brands go make sure that all their products are tried, tested and proven to live up to expectations and are able to deliver unique features. For example, if you’re looking for a polo that will wick moisture off your body throughout the day the Nike Golf Dri-Fit polo shirts will do just that! Nike is such a reliable and trustworthy brand that you don’t have to think twice about if the Nike Golf Dri-Fit shirts will do what it advertises. Pairing your logo alongside these top-notch brands will make your brand look more credible and trustworthy towards customers. If you’re looking to add your logo, we offer custom embroidery and screen printing on all our apparel and accessories at low competitive prices. For imprint inquires, you can speak to a friendly customer representative at (877) 695-9722 or email your questions to support@nyfifth-inc.com.